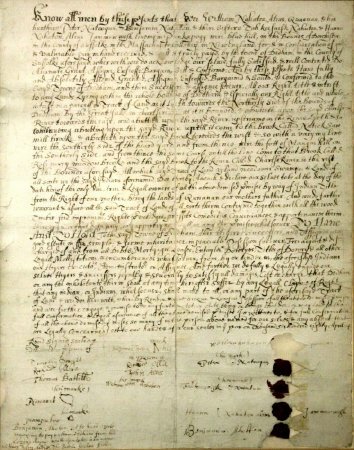 This deed from 1680 records the sale to Dedham of the land that had belonged to Nehoiden's father. It is signed by Nehoiden and four of his siblings. William Nehoiden was a Native American preacher and schoolmaster. He was born around 1635. His family was converted to Christianity by Rev. John Eliot in the 1640s and moved to the "Praying Indian," or Christian convert, village at Ponkapoag. Educated by Eliot, Nehoiden could read and write in English. He also helped Eliot to translate the Bible into Algonkian. In 1671 Nehoiden was one of three emissaries sent by Eliot to Metacom, known to the English as "King Philip," in an unsuccessful attempt to avoid war between the Indians and the English. 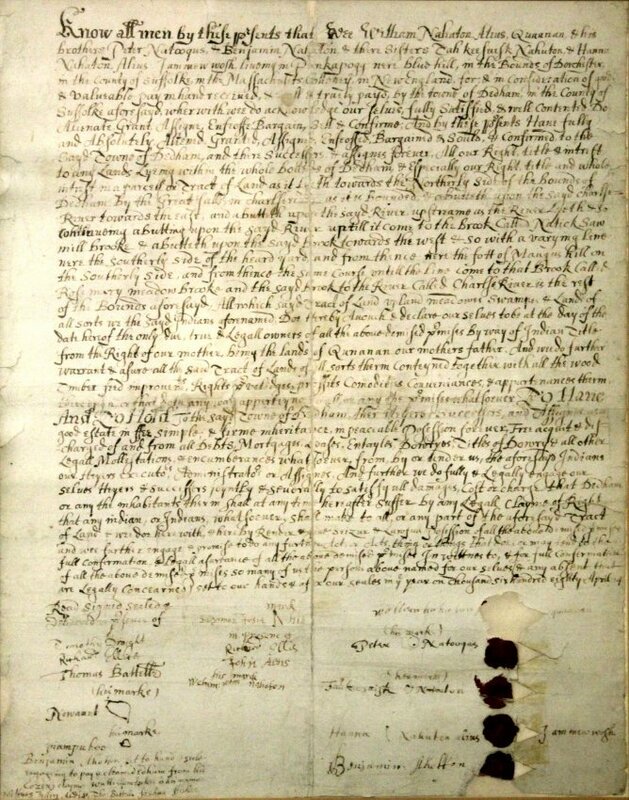 During King Philip's War in 1675, Nehoiden helped Eliot bring food to the Native Americans interned on Deer Island, and after the war he often negotiated with the General Court on their behalf. After King Philip's War, the power of the local tribes was broken, and any remnants of the peaceful collaboration that characterized the early settlements was swept away. Many of the defeated Native Americans were sold into slavery. Many others moved out of this area to live with other tribes. The few remaining gathered in some of the old villages such as Ponkapoag, leaving large parcels of tribal land to be claimed by the growing number of English settlers. The land, north of the Charles River as far as the Upper Falls, would become the Dedham North Parish, and eventually, Needham and Wellesley. This sale is commemorated on the Needham Town Seal.